Thailand’s Deputy Prime Minister and Defence Minister Prawit Wongsuwan yesterday instructed Pol Maj-General Surachate Hakparn, Thailand’s acting Immigration Bureau chief to crack down on foreigners overstaying their visas or using Thailand as safe haven for criminal activities. Pol Maj-General Surachate Hakparn has been given one month to arrest and deport thousands of foreigners suspected of staying in the Kingdom illegally, the Nation Reported. Following Prawit’s order, Surachate led police yesterday in collaring 22 citizens of African nations and a Myanmar man on Bangkok’s Sukhumvit Soi 3. Eight of them had their documents in order and were released, while Luke Okoli, 18, of South Africa, was charged with possession of marijuana and unlawful entry into the Kingdom. Kevin Asok, 29, from Guinea, and Ake Dikajvuidi, 25, and Ramaqami Kapita Mwati, 27, of Congo, were charged with carrying fake passports. Ten others were charged with entering Thailand illegally, including the Myanmar man identified only as Suneil, 22. 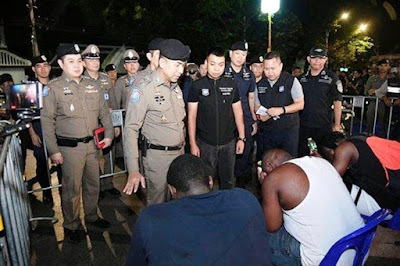 The others were John Omo, 26, of Zimbabwe, Chers Igbosonu, 24, of Mozambique, Gabriel Williams, 29, of Liberia, Yamoah Gilbert, 19, and Boyyant, 27, of Ghana, Chibueze Casmir, 31, of Nigeria, and Masud Masata, 23, and Mongolola Jacques Pilipili, 19, of Congo.